This is a foreign exchange guide to Morocco, the Moroccan Dirham currency plus MAD transfers and travel tips. Morocco is a gateway to Africa, and a country of dizzying diversity. Here you'll find epic mountain ranges, ancient cities, sweeping deserts – and warm hospitality. From Saharan dunes to the peaks of the High Atlas, Morocco could have been tailor-made for travellers. With a rich history, landscape, and culture, Morocco is one of my favorite spots on Earth. With choices ranging between the red Atlas Mountains to the explosion of colors in the endless markets scattered around the ancient medinas, this place has a unique beauty all its own. Go in spring when lots of Morocco is lush and green. Don't underestimate the extremes of summer and winter, they can be brutal. Ramadan is an interesting time to travel, but be aware that many restaurants and cafes will be shut during the day. Can you buy Moroccan Dirham abroad? The Dirham is officially designated as a closed currency meaning it is normally only available within Morocco, however, Dirhams can sometimes be found being sold and bought in travel agencies and at major airports in several countries. The import and export of the currency is tolerated up to a limit of 2000 MAD. Currency purchased in excess of this limit during a visit to Morocco should be converted back before departing. Travellers should be advised to keep the receipts of currency exchange, as these will be required for the conversion of Dirham back to foreign currency prior to departure and before you go through passport control. You can change as many Dirhams as you have left. At Marrakech airport the exchange rate is very similar to that in the town centre, so there is not much loss in waiting to the last minute to change your remaining Dirhams. At Casablanca airport, the exchange rate applied by the companies working out of the luggage belt area is way more favourable than the one applied in the luggage belts area. Can you pay in euros in Morocco? Euros and US dollars are often accepted in Morocco however make sure you are always aware what the dirhams exchange rate is. You may be able to bargain a cheaper price for purchases using a foreign currency. Although the Euro, US Dollar and, to a lesser extent, Sterling are accepted in certain tourist areas, the the Moroccan currency (the Moroccan Dirham) is required for everyday use. Dirham is normally purchased within Morocco, and can be obtained from bureau de change in airports, major banks and hotels, or from cash machines, which are widely available in major towns and cities and will take most UK credit and debit cards. Some bureau de change outside of Morocco also now offer Dirham, but they tend to offer poor rates of exchange. Using a debit card at an ATM is often the easiest and cheapest method. In the country side and smaller towns cash points are rare and cards are often not accepted. Can I use Credit Cards in Morocco? Yes, especially in the bigger cities banks and ATMs are easy to find. The the more rural areas this is not the case so be sure to have some currency with you before heading cross county. This may also be convenient in cities for purchase in small shops and stalls. Also important, before setting out on your Moroccan travels make sure you inform your bank that you will be using your Visa debit card in unfamiliar locations such as Morocco, in case their Fraud watch department flags up a panic situation and places a stop on your card, you can either write to your bank or send an email. Getting around Morocco is pretty straightforward – transport networks between towns are good, and even off the beaten track there’s often something going your way. Royal Air Maroc offers internal flights, the rail network is excellent in linking the major cities (with a high-speedTGV line between Tangier and Casablanca currently under construction), and large bus companies such as CTM are comfortable and efficient. Local networks are cheaper and more cheerful and do the job. When travelling on public transport, it’s considered both selfish and bad manners to eat while those around you go without. Always buy a little extra to offer to your neighbours. If you offer food, etiquette dictates that your fellow passengers should decline it. It should be offered a second time, a little more persuasively, but again it will be turned down. On a third, more insistent offer, your neighbours are free to accept the gift if they wish to. If you are offered food, but you don’t want it, it’s good manners to accept a small piece anyway, and to pat your stomach contentedly to indicate that you are full. In return for participating in this ritual, you should be accorded great respect, offered protection and cared for like a friend. Petit and Grand taxis are a great way to get around, but be prepared to wait, grand taxis won't leave until all six cramped places are full. Agree the taxi fare before entering a petit taxi. You can normally get anywhere in Marrakech for under 50 dh. The cheapest and most efficient way to travel around the country, buses are generally safe, although drivers sometimes leave a little to be desired. Stay in a riad, they are a traditional Moroccan house built around an internal garden. Treat bargaining in souks as a friendly game. It’s an intrinsic part of the culture and is always expected of you, so just ignore the first price a merchant puts forward. Visit Saadian tombs but decline the offer of a tour guide, they are worth seeing but aren't that big. Be sure to watch the main square come alive from a rooftop restaurant. While most visitors head for Marrakech don't miss Fez. For visitors, the medina of Fès el-Bali (Old Fez) is the city’s great draw. It’s an astounding view of the old world, filled with narrow lanes and covered bazaars fit to bursting with aromatic food stands, craft workshops, mosques and an endless parade of people. Old and new collide, the man driving the donkeys and mules that remain the main form of transport is likely to be chatting on his mobile phone, while the ancient skyline is punctuated equally with satellite dishes and minarets. 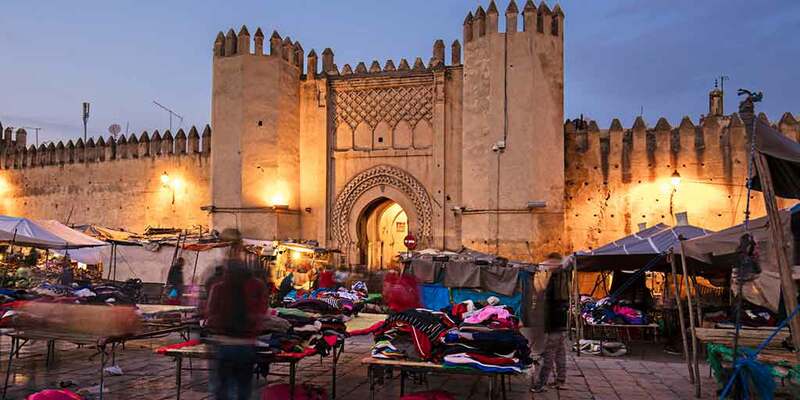 When searching around for information on how to get a good exchange rate when sending money to Morocco you need to start with finding out the latest Moroccan Dirham foreign-transfer exchange rate. In recent years Marrakech has seen a number of high-profile property scams - typically sales by those who didn't actually own the land. The government is working to bring property registration in line with the French model of title deeds issued via land registry, overseen by notaries. The vast majority of new homes in and around Marrakech are sold in this way. Real estate agents advise that customers should avoid buying property using the older system based on local Islamic law. Buyers should avoid buying a property until the title deed has been obtained. Typically the buyer will deposit ten percent of the purchase price with the Notary. When the requisition is obtained, typically 4 to 6 weeks later, the buyer will pay the rest of the purchase price. Once your funds are received by the provider the converted MAD amount will be transfered to the recipient account you specify in Morocco.